A year ago this month the Catholic Bishops’ of England and Wales published Guidelines for the Preparation of Couples for Marriage, a very important document indeed for Marriage Care and indeed for all those involved in preparing couples to make a lifelong commitment to one another through the Sacrament of Matrimony. This is an encouraging document in so many ways. Firstly it reiterates all that Pope Francis has written in The Joy of Love about the need for marriage preparation to be both practical and encouraging for couples. Secondly it places the weight of the bishops behind all our efforts to make sure couples receive the best that we can give them, whether through a Preparing Together group course or through a series of FOCCUS sessions. Moreover the Guidelines document also encourages dioceses to do more locally to bring marriage preparation facilitators together for regular support and encouragement, to identify any gaps in provision and to fill them. The Guidelines also clearly delineate the role and importance of courses such as those we provide, from the preparation offered by others, especially the parish priest, in the parish. Everyone has their part to play and collaboration is essential, in service of the greater good. The emphasis is on accompaniment and within the document there is an invaluable diagram to illustrate the stages of accompaniment. Marriage Care’s particular gifts come into play in stages 3 and 7. In their theological preface (#12) the bishops’ point out that “for the baptised, marriage is a particular witness to the love of God in the world.” The same can be said of Marriage Care volunteers who witness to the love of God (knowingly or unknowingly) each time they go the extra mile to support couples, whether in the best or the worst of times. 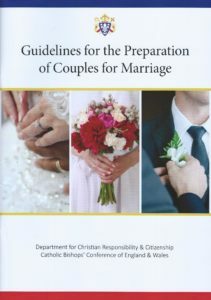 More information about the Guidelines can be found on the catholicfamily.org.uk website with copies available to buy from Matthew James Publishers.